Continuing its evolution of on-camera light sources, the Juno TTL Flash for Canon from Phottix Combines the automation and accuracy of TTL with multiple wireless remote triggering options and multi-camera brand compatibility. Among the flash's core features is TTL Auto-Switching that allows shooting with multiple camera brands. Although the hot shoe is Canon-specific, TTL protocols for Canon, Nikon, Sony, and Pentax built into the Juno allow it to automatically switch between them when using compatible Phottix Odin II transmitters, eliminating the need to swap out flash units when switching cameras. Adding to its versatility, Auto-Metering brings the convenience of TTL even when using the flash manually by employing a test flash that can be dialed in for an accurate exposure. Commander Mode permits the flash to trigger many other Phottix products such as Odin II and Ares II receivers, and the Indra 500 monolight, while its 2.4 GHz receiver is compatible with Phottix Odin II, Ares II, Strato II, and Elinchrom Skyport transmitters at distances up to 328'. Other convenience features include High Speed Sync, Stroboscopic Mode for firing 1 to 100 flashes, and +/- 3-stop exposure compensation. The powerful Juno has a guide number of 197' at ISO 100 and the 200mm setting and offers wide focal lens support via its zoom range of 20-200mm, as well 14mm lens coverage using its pull-out diffuser. Fast recycling of 0.1 to 3 seconds ensures that shooters don't miss any of the action. Users can reposition the head easily for bounce lighting thanks its head with tilt that's adjustable from -7 to 90° and rotatable 180° left or right. The flash will recycle as fast as 0.1-3 seconds ensuring that shooters don't miss any of the action. The Juno runs on four AA batteries, while its also compatible with Canon's CP-E4 battery pack. Wedding and event shooters working with second shooters or multiple camera systems can now benefit from added flexibility with the Juno TTL. Even though the hot shoe is camera system specific, the TTL protocols for Canon, Nikon, Sony, and Pentax have been built into every flash. Juno will automatically switch between TTL protocols when used with compatible Phottix Odin II Transmitters, eliminating the need to switch lights when switching cameras. Photographers can now benefit from the speed and convenience of TTL even in manual mode. Auto metering uses a test fire to quickly suggests exposure settings that can then be dialed in for a perfect exposure. 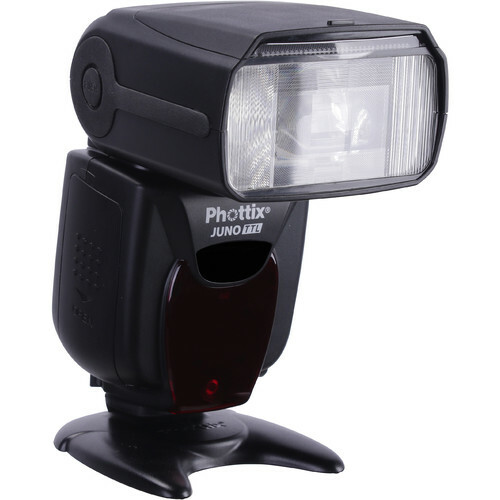 The Juno TTL is the cornerstone for the Phottix lighting ecosystem designed to grow with photographers as their needs and skill level progress. Juno TTL can be used to control and fire many other Phottix products including Odin II Receivers, Ares II Receivers and Indra 500. Juno TTL's built in wireless 2.4 GHz receiver is compatible with Phottix Odin II, Phottix Ares II, Phottix Strato II, and Elinchrom Skyport transmitters. Box Dimensions (LxWxH) 9.7 x 4.3 x 3.8"